Are your Thanksgivings less about giving thanks and more about family discord? It’s nothing new, according to Melanie Kirkpatrick, author of Thanksgiving: The Holiday at the Heart of the American Experience. “There’s a letter dating from 1779 from a woman complaining to her cousin about how difficult grandmother was at the holiday table.” But somewhere inside, each of us knows the true meaning of this holiday. “The first Thanksgiving was a moment of thanks, and of hospitality and fellowship between two diverse peoples: the English settlers and the Native Americans. It was a very friendly moment,” Kirkpatrick reminds us. But somewhere inside, each of us knows the true meaning of this holiday. Do some journal writing before festivities. Remind yourself of the meaning of the holiday and jot down some ways you can avoid conflict. Strengthen generational ties by asking older members of the family to describe how they got through hard times. Experience with resilience can be educational and inspirational to younger people. Encourage conversations with kids about what they are most thankful for, other than their possessions. Go around the table, having each person share what he or she is thankful for. Continue a ritual or start a new one. Read a short story each year at the table, for example. Kirkpatrick’s book has a collection of Thanksgiving-themed shorts for just this reason. Beware of sibling rivalry. Old arguments and competitions are easily rerun at Thanksgiving, sometimes subconsciously. Make an effort not to compete and to compliment your family members instead—even if you don’t feel like it in your heart. Being polite will make Thanksgiving dinner a lot more peaceful than speaking your mind. This isn’t the moment to hash it out. Don’t discuss money at Thanksgiving. It plays a big role in everyone’s lives, whether it’s simple competition or stress over a family loan that hasn’t been paid back. If there are stressful things you need to discuss with family, save it for later. Ask your family member to meet on a specific day and time after the holiday to discuss it. This creates a stress-free bubble over the holiday dinner. Avoid newsworthy hot-button conversation topics. If politics set off fireworks, make a pact with yourself to avoid the topic at Thanksgiving. 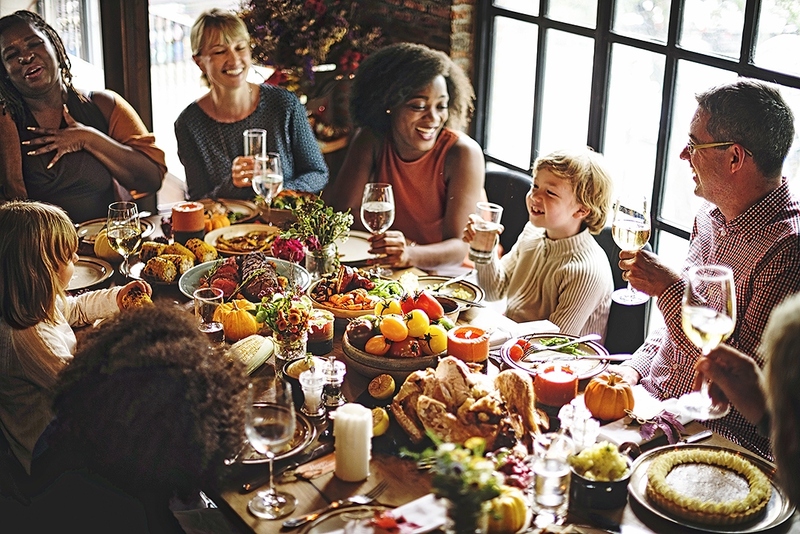 Every family has their third rail when it comes to what starts stressful fighting at Thanksgiving—all you have to do is make yourself aware of them and decide to keep quiet if they come up. Keep in the forefront of your mind the true meaning of the holiday: that it’s about the blessing of our nation and of our individual families. If you can be mindful of what you are grateful for, that’s an effective way to help keep your calm. Having the gravy turn out perfectly is not the goal of Thanksgiving.